Indie Craft Shops: IB needs your help! EnglishI’d like to open a new section/category on IB called “Indie Craft Shops“. It’s been a while that I dream about a place where to find new and cool physical stores around the world who sell handmade by indie artists and small brands, and I think that many of you could like the idea too. Who doesn’t dream their creations are known and sold abroad? But to bring this section to life IB needs your HELP! I’m sure that many of you already know about some of these shops in your area and probably visited or bookmarked some discovered in other countries too. 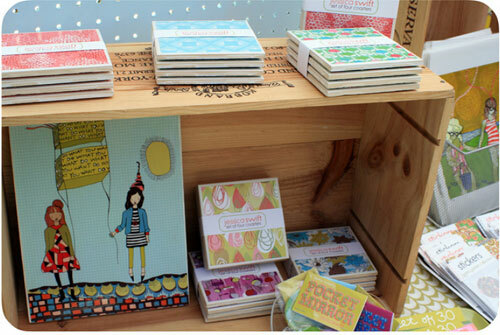 Well, whichever way you hear about these nice Indie Craft Shops, it’s time to share them! Just write me an email remembering to tell the complete physical address of the shops + their web site address (if they don’t have one but you know their blog/facebook/flickr/twitter, write me the link). That’s it! Remember we’re talking about physical shops, not the ones that only sell online and that everyone who will suggest a nice shop will be mentioned in the post with a link that will point to her personal blog, shop or page (a little thanks for helping IB ♥). I wait for your links! ItalianoMi piacerebbe aprire una nuova sezione /categoria in IB di nome “Indie Craft Shops“. E ‘da un pò che sogno uno spazio dove trovare dei bei negozi fisici da tutto il mondo che vendono oggetti handmade fatti da artisti indipendenti e piccoli brands, e penso che l’idea potrebbe piacere anche a molti di voi. Chi non sogna che le proprie creazioni siano conosciute e vendute all’estero? Ma per dar vita a questa sezione IB ha bisogno del vostro aiuto! Sono sicura che molti di voi conoscono già alcuni di questi negozi nella propria zona e, probabilmente, ne hanno visitati alcuni in altri paesi e/o salvati fra i preferiti nel pc. Beh, in qualunque modo siate venuti a conoscenza di questi Indie shops, è il momento di condividerli! Scrivetemi una email ricordandovi di comunicare l’indirizzo fisico completo dei negozi + l’indirizzo del loro sito web (se non ne hanno uno, ma conoscete il loro blog / facebook / flickr / twitter, scrivetemi il link). Questo è tutto! Ricordate che stiamo parlando di negozi fisici, non di quelli che vendono solo online e che coloro che suggeriranno un bello shop, verranno citati nel post con un link diretto al loro personale blog, shop o pagina web (un piccolo ringraziamento a chi aiuta IB ♥). 2 comments to Indie Craft Shops: IB needs your help! I sell a bit of my work in this really sweet shop called Hello-Lucky in Houston, tx. The owner- teresa I’d an old friend of mine. She makes alot of the things in it and has different artists and makers show there work too. It’s a tiny shop packed full of interestingthings from paintings to clothes, jewelry and ceramics. I have some photos of it that I took a while ago too. Hi Carole, thank you so much for sharing this shop! I’m saving its data in my “Indie Craft Shop” submission folder. If you could also send me via email the photos you took, it would be great.